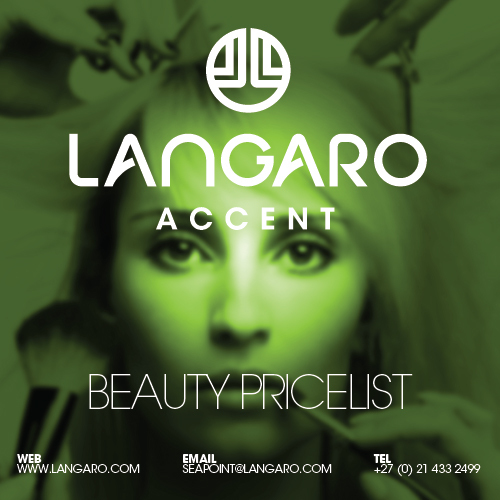 Langaro offers a full range of beauty treatments in a relaxed but professional environment from our Camps Bay Spa. 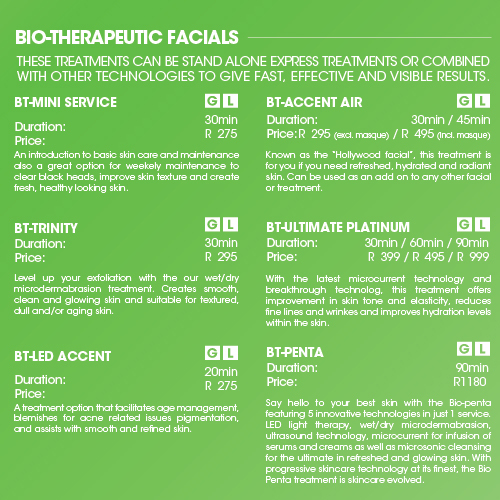 We offer revitalizing facial treatments, anti-aging facials, hair removal/waxing, tinting and spray tan solutions for men and woman who are serious about looking after their skin and serious about looking after themselves. Prepare to shape up and restore your glow with a personalised beauty therapy treatment in one of our private treatment rooms in Camps Bay. We offer revitalizing facial treatments, anti-aging facials, hair removal/waxing, tinting and spray tan solutions for men and woman who are serious about looking after their skin and serious about looking after themselves. Whether you want instant radiance or a complete skin overhaul, our prescription facials are tailored to your skin’s specific needs. From anti-ageing to spot-busting, from deep purification, to intense hydration, soothing nourishment or anti-aging, we offer the best facial treatments for every skin type and condition. 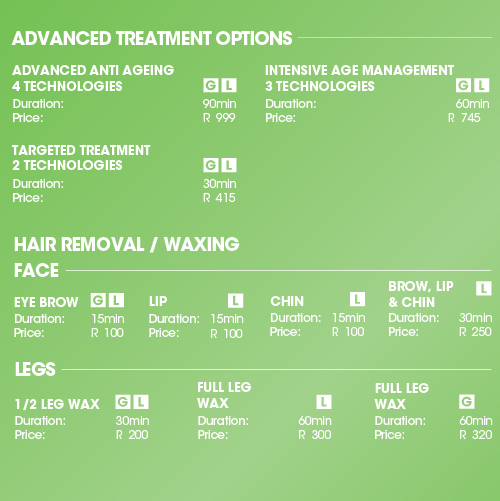 Please note that all out facials include a consultation time. A Comfort Zone signature treatment is a sensory experience of smell, sound and touch to awaken your skin, body and spirit. The wide range of the latest products which contain natural active ingredients free from silicones, parabens, mineral oils and artificial colours will feed and nourish all skin types. Deep hydrating anti-aging & anti -wrinkle skin treatment to restore moisture and radiance to the face, neck and décolleté. Includes a luxurious Hydra-mask. Suitable for dry and dull skin suffering from sun exposure, air-conditioning or travelling. A deep cleansing ‘facial for your back’. Exfoliate and extract impurites and congestion on the back. Suited for oily and combination skins which suffer blocked pores, breakouts, blackheads and whiteheads. Reveal vibrant, younger looking skin with a bespoke anti-ageing facial, tailor made to your specific concerns. Our therapists will use a combination of technology, massage and advanced products to smooth, illuminate, lift, protect and repair. Smooths the first appearance of soft lines and premature fine wrinkles, illuminates dullness and improves skin tone by stimulating epidermal cells renewal. Treatment includes a double cleanse, and a gentle double salon peel. Excludes exfoliation. 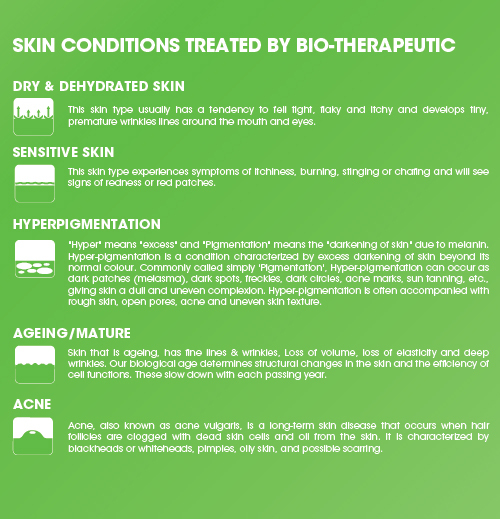 Suited for sensitive or normal skin which has aged prematurely. The Sublime Skin Deluxe Lift luxurious treatment offers an immediate lifting and anti-aging effect for skin showing signs of degeneration, dehydration, loss of volume, sagging and deep wrinkles. Considered a step up from the Sublime Skin Double Peel, it combines the smoothing and illuminating effect of the double peel with a firming biphasic mask. Includes a roulage or facial massage to stimulate blood circulation and firm tired, sagging skin. 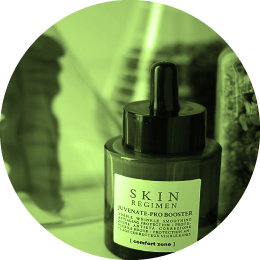 Suited for mature skins showing visible signs of ageing. The perfect solution for millennial skin, designed to address the effects of environmental pollution, modern day fatigue, and an urban lifestyle. After a cleanse and a gentle peel, products are customised to correct specific imperfections like stress-related ageing, breakouts, dullness, fine lines, dullness or dehydration, and finished off with an anti-pollution shield. Suited for a time-pressed women and men, especially men with beards. Professional grade products with results-intensifying ultrasonic and microcurrent technology, radically boosts your skin in just 30-minutes. Targeting your key concern for maximum impact in minimum time, this treatment is a firm favourite with those who want visible results fast. Intensive resurfacing treatment, dramatic results. This super charged treatment features our professional grade peel powered up with the latest ultrasonic and microcurrent technology and advanced active ingredients. Achieve dramatically smooth skin and address signs of acne, ageing and hyperpigmentation with this professional chemical peel without downtime. 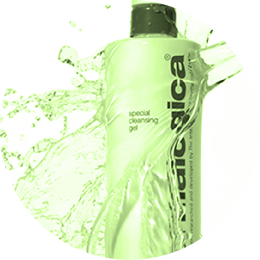 Dermalogica Clear Start Teen facial will leave your teen feeling healthy and happy. Focused on improving overall skin condition, clearing congestion and blackheads, treating acne and breakouts, soothing inflammation, and hydrating dry, flaky teen skin, it is the perfect treatment for teenage boys and girls. Skin Care for Life inside and out. 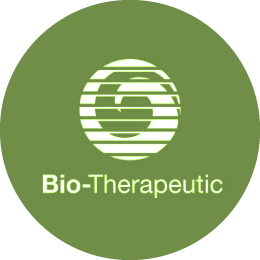 Bio-Therapeutic South Africa provides skin therapy where clients receive highly personalized services based on the Bio-Therapeutic technology. A 30-minute focussed mini facial. Choose whether you want to clear congested t-panel areas or plump fine lines and soft wrinkles around the eye and forehead area. Suited for time-presses client who want a focused fix. Instant results for all skin concerns. A customised facial using the award winning bt-Sonic facial cleansing brush, and a bt-Micro to exfoliate and drive product into the skin. 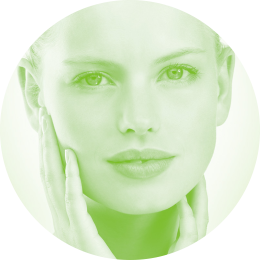 Customised products will treat specific concerns like acne, dull skin, dehydration or fine lines and wrinkles. Treatment is finished off with a bt-Infusion masque; choose ‘Collagen’ to fight aging, ‘Clearing’ for breakouts, ‘Hydrating’ for moisture, ‘Brightening’ for dull skin or ‘Vitamin C’ for sun damage and pigmentation. Customised to suit all and any skin conditions and types. 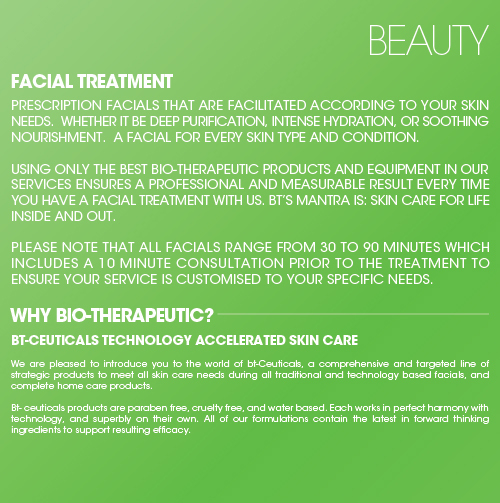 An advanced express facial using two award winning Bio-Therapeutic technologies. Start off with a wet/dry microdermabrasion for superior exfoliation. Follow up with an anti-aging microcurrent treatment to lift, firm and plump sagging or wrinkled skin OR choose the LED light therapy for acne, hyperpigmentation, sensitive and inflammed skin. Finish off with a bt-Infusion masque; choose ‘Collagen’ to fight aging, ‘Clearing’ for breakouts, ‘Hydrating’ for moisture, ‘Brightening’ for dull skin or ‘Vitamin C’ for sun damage and pigmentation. OR choose a Collagen & Elastin Ampoule to support elasticity and rebuild healthy skin. Customised to suit all and any skin conditions and types. 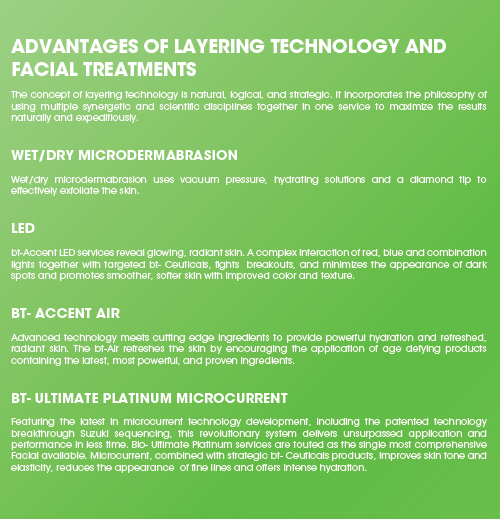 The ultimate bespoke facial which layers four Bio-Therapeutic technologies; wet/dry microdermabrasion for superior exfoliation, microcurrent to lift saggy skin and muscles, LED light therapy for age management, sensitive or pigmented skin, and Oxygen therapy to instantly plump, lift and firm. Treatment is finished off with a bt-Infusion masque; choose ‘Collagen’ to fight aging, ‘Clearing’ for breakouts, ‘Hydrating’ for moisture, ‘Brightening’ for dull skin or ‘Vitamin C’ for sun damage and pigmentation. This facial is ideal for age management, anti-aging, acne, pigmentation or dry, dull and dehydrated skin. Customised to suit all and any skin conditions and types. Finish off with a bt-Infusion masque; choose ‘Collagen’ to fight aging, ‘Clearing’ for breakouts, ‘Hydrating’ for moisture, ‘Brightening’ for dull skin or ‘Vitamin C’ for sun damage and pigmentation. OR choose a Collagen & Elastin Ampoule to support elasticity rebuild healthy skin. This facial is ideal for age management, anti-aging, acne, pigmentation or dry, dull and dehydrated skin. Customised to suit all and any skin conditions and types. The curative and restorative power of many African plants is legendary because they work. 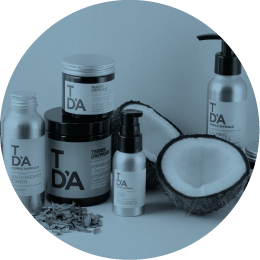 Terres d’Afrique delivers pure, organic skincare manufactured and created in South Africa, from natural ingredients sustainably sourced in Africa to support and empower local industries. Enjoy the rich aroma of natural superfood ingredients while the Afrique Arising massage technique stimulates the blood flow to the skin. Omega-rich Terres d’Afrique oils and linoleic acids will richly re-hydrate the deep layers of the skin. Vitamins from the Baobab tree will restore the skin’s elasticity leaving it supple, plumped and smooth. Favoured by nature-lovers, eco-friendly, healthy-conscious individuals who want a true African experience. Suited for dry, dehydrated skin. 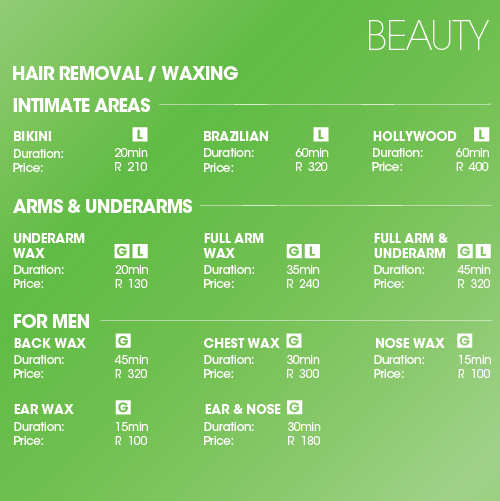 Remove any unwanted hair with only the best ItalWax. These low temperature waxing treatments for the face and body provide the most effective and virtually pain free hair removal with minimal discomfort. Langaro offers Epilfree, a revolutionary permanent hair reduction treatment with laser-like results. Its organic, chemical free formula is effective on all skin and hair types, even over tattoos. Epilfree is affordable, safe for men and women and can be used on the face, body and intimate parts. After more luscious lashes, or greater definition of your brows? 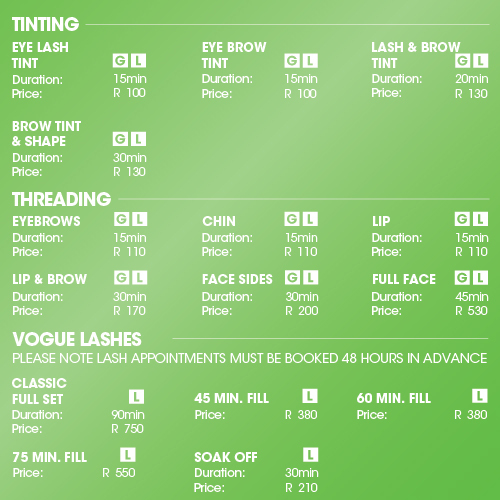 Our experienced therapists will create a look for you that is totally natural, totally luscious, or super over the top glamorous – the choice is yours.